Another batch of beer brewing, this one is cream ale, calls for a feast. 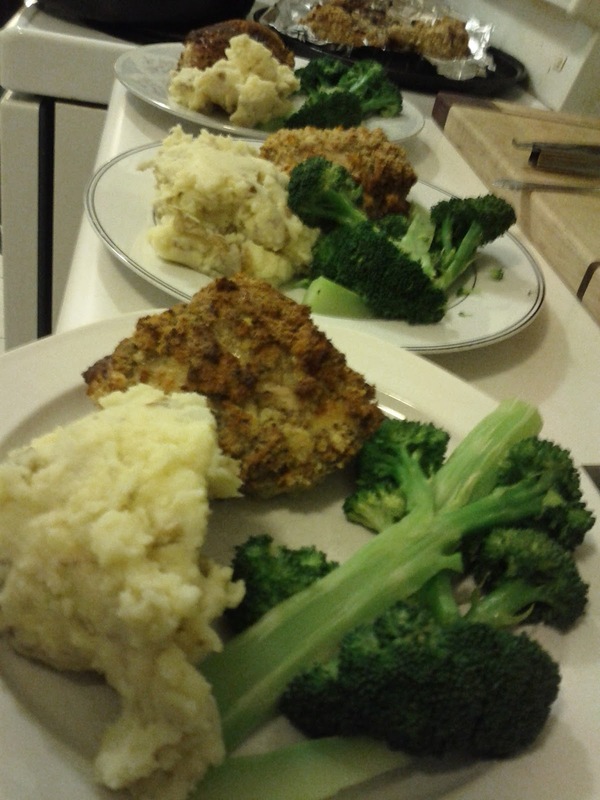 I made some chicken, half friend and half baked, cheesy bashed potatoes, and steamed broccoli. Marinate the chicken (8 leg pieces, cut and trimmed by butcher) in buttermilk for at least 4 hours, preferably overnight. I added a few tablespoons of salt to the buttermilk so it brined the chicken as well. This makes it extremely tender and juicy once cooked. Pat the chicken dry with a paper towel, coat in egg wash (4 beaten eggs, 1Tbsp pesto, 1tbsp mustard) and roll in bread crumbs (4 slices stale bread ground fine as you can get it), repeat. Bake half on a greased sheet for 30min at 450, then 30 min at 350. Pan sear and finish other half in the oven at 350 for 30 min. Once done, let meat rest for 10 minutes so it stays juicy and doesn't hurt to eat. Boil potatoes until fork tender. Add 1/2C butter, 1/2C old cheddar, a few tablespoons of milk for consistency, and a few dashes of habanero hot sauce. Season to taste and bash until uniform. I like mine a bit lumpy to remind me it used to be potatoes. I liked the baked chicken better than the pan seared. The chicken must have had daddy issues because it couldn't keep its bread clothes on. The breading was delicious, pesto really works here, but the bottom part stuck to the pan and the top part mostly came off in one piece unless special attention was given to make that not happen. Ladypants told me I had "outdone myself", so that sounds pretty good. Potatoes really can't be bad with that much butter and cheese, but the hot sauce lent a slight spiciness that put it over the top. Steamed broccoli is green. This is an extremely tasty dish, especially when washed down with a pint of homemade IPA.